So you need to sniff packets on ESXi 5x for troubleshooting purposes and you are not sure how to get it done. Hopefully this post will assist you. You can access the ESXI CLI from the console or via Putty/xterm by enabling SSH on the host. I prefer SSH access because the buffers in Putty/xterm make life easier. 1) Enable SSH on the host. a) In vCenter, select the Host > Configuration tab > Security Profile > in the Security Profile section click Properties. b) Scroll down to SSH and select it, then click Options > Start > OK > OK.
c) Launch an xterm or PuTTY session to the ESXi host and login as root. 2) Determine what VMKernel Ports you have on the host. 2) In this case we have two. Your production systems should have more. vmk0 – ESXi management network. The default VMKernel Port created when you install ESXi. vmk1 – vMotion and iSCSI. This is one I created for my LAB used for vMotion and iSCSI traffic. 3) At its most basic, specify the vmk port number and you see the packets fly by. a) to stop, simply press CTRL+C. a) tcpdump-uw only captures the first 68 bytes of data from a packet. To capture the full packet, use the -s option with a value of 1514 for normal MTU or 9014 for jumbo frames. b) Also, tcpdump-uw can capture a max of 8138 bytes because of buffer constraints. The -B 9 option increases the buffer allowing the capture of up to 9014 bytes. c) Captures on the vmkernel interface (vmk) only captures network traffic traversing to and from the vmkernel on that interface. It doesnt capture traffic moving across the Virtual Switch. d) There are quite a few option for so play around with them. 4) A few examples to get you started. a) Dump packets on vmk0 with default MTU very verbose output showing only DNS packets (port 54). b) Same as above except show NTP packets. c) Is vCenter communicating properly with the ESXi host? d) Filter by transport type – TCP or UDP. e) Filter for ARP packets. 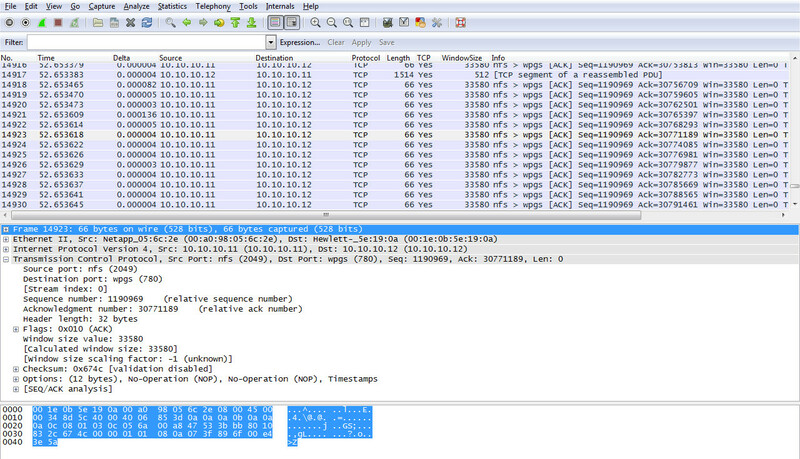 5) You can dump the traffic to a pcap file and open it with Wireshark. Before you start the capture, change directories so you can easily recover the pcap file from the datastore in vCenter. c) Right-click the esxihost01.pcap file > select Download, select a location and click OK.